In hindsight I really should have reviewed each half of this season separately, partly because there was such a gap in broadcast that I’ve forgotten some of what happened, but mostly because tonally the two halves are very different. With that in mind there will be spoilers for both halves in this review, so I really do recommend that you don’t read it before watching. And I DO recommend that you watch it! Season 3 for once didn’t end on a cliff hanger, in fact it ended on an almost positive note and the fourth season starts in the same way. The prison is safe and in the skipped over couple of months everyone has settled in and the community is thriving. Rick has hung up his gun, taken up farming and seems at peace. I do rather wish that we’d got to see a bit more of this time, to see how these characters act with the pressure taken off. It would also give us a chance to get to know the new characters a bit more before the blood starts flying and they all start dropping again. But it’s not to be and before long the prison is under threat again, this time from a simple illness. As a ‘big bad’ it’s a good choice following the Governor, not a human enemy or even a zombie one, just a bug that under normal circumstances would probably have been defeated by simple antibiotics. It highlights that they may be able to start farming and building effective all-be-it medieval defences, but there are certain things like medicine that they cannot easily replace. While the threat was tangible to the characters, for the viewer however it was rather undermined by the fact that most of the people effected were characters that we’d only just been introduced to, so as people started dying all it really did was bring the prison numbers down and refocus on our core characters. But we’d spent so little time in this shiny new safety that it didn’t feel anywhere near as much a loss as it should have. It was an interesting story however, and I was rather frustrated to see it interrupted by the return on The Governor. David Morrissey is amazing and everything, but I was kind of finished with his story. It was good to have him alive out there somewhere as a kind of boogeyman, but to have him return so quickly and monopolise entire episodes was frustrating. In fact that’s a theme that repeats through all of Walking Dead, the structure by which many episodes focus on one small group rather than inter-weaving the stories over multiple episodes. It sort of raises the intensity of that storyline to a level beyond intense, you don’t get the time to think about the stories and read between the lines of what is happening and how the characters would be feeling. Also of course if it’s a character you’re not that interested in, you spend the whole episode just wanting to get back and check in with the others. That structure was heavily used in the second half of the season and I found it quite frustrating. So, the Governor comes along with a tank a brutal and devastating murder and everything falls apart, the prison falls and everyone is scattered. It’s the kind of utterly pointless and destructive act that makes perfect sense for how The Governor would end it all – no one wins. It resets everything to square one – small groups fending for themselves with absolutely nothing. It’s both depressing and energising. Particularly as most of the small groups are almost deliberately muddled up, so previously relatively unconnected characters are thrown together. It gives an opportunity to see characters in new lights, brings people to the forefront of the stories and refocus them on what is really important to them. On an emotional level when they do find each other, it’s a huge moment for characters and audience alike. 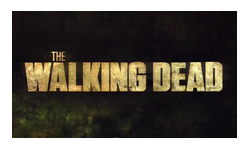 I don’t think this is the strongest season of Walking Dead (I think season 2 would probably win that competition). There were a couple of slightly tenuous jumps for both characters and plots, occasionally letting down one of the strengths of the show whereby people learn, evolve and get stronger. There were mistakes, I’m not sure I believed Carol’s stroy, surely if they had a plan for escaping the prison they’d also have set up rendezvous points, and how had they never heard of Terminus before despite being in walking distance of the tracks and the signs. I think the season, particularly the second half, would be better watched in a marathon so that the frustrations of not seeing characters for multiple episodes were decreased. 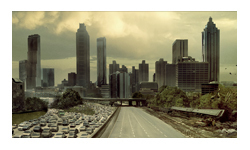 The Walking Dead remains one of my favourite shows on television at the moment, and I think, one of the best there is. It exemplifies what science fiction (to me) is all about – taking a relatively simple change of situation and playing it out to the full to show what that means for individuals, groups and indeed society as a whole. The show manages to blend character moments with action sequences, gory mindless horror with edge of your seat psychological suspense and just enough hope and happiness to make you want to watch. It’s going to be a very long summer waiting for the series to return.